YOU’VE SEEN HER ON SCREEN IN THE OC, GREY’S ANATOMY, AND COUNTLESS OTHER HIT SHOWS, BUT YOU MAY NOT KNOW HER NAME. THAT’S ALL ABOUT TO CHANGE. 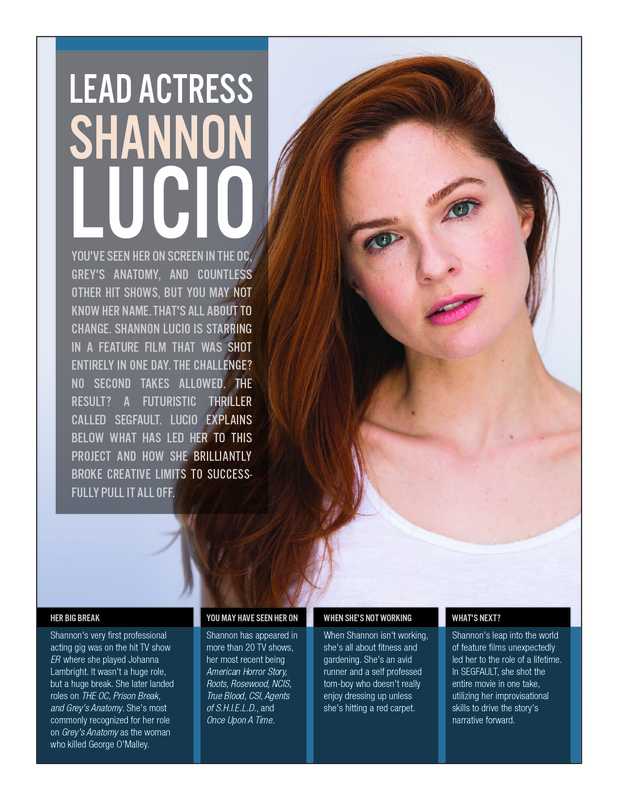 SHANNON LUCIO IS STARRING IN A FEATURE FILM THAT WAS SHOT ENTIRELY IN ONE DAY. THE CHALLENGE? NO SECOND TAKES ALLOWED. THE RESULT? A FUTURISTIC THRILLER CALLED SEGFAULT. LUCIO EXPLAINS BELOW WHAT HAS LED HER TO THIS PROJECT AND HOW SHE BRILLIANTLY BROKE CREATIVE LIMITS TO SUCCESSFULLY PULL IT ALL OFF. Shannon’s very first professional acting gig was on the hit TV show ER where she played Johanna Lambright. It wasn’t a huge role, but a huge break. She later landed roles on THE OC, Prison Break, and Grey’s Anatomy. She’s most commonly recognized for her role on Grey’s Anatomy as the woman who killed George O’Malley. Shannon has appeared in more than 20 TV shows, her most recent being American Horror Story, Roots, Rosewood, NCIS, True Blood, CSI, Agents of S.H.I.E.L.D., and Once Upon A Time. When Shannon isn’t working, she’s all about fitness and gardening. She’s an avid runner and a self-professed tom-boy who doesn’t really enjoy dressing up unless she’s hitting a red carpet. Shannon’s leap into the world of feature films unexpectedly led her to the role of a lifetime. In SEGFAULT, she shot the entire movie in one take, utilizing her improvisational skills to drive the story’s narrative forward.